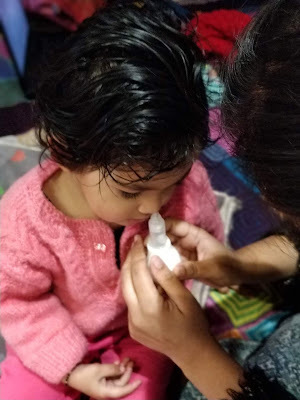 Winters have arrived and from a toddlers perspective the season of common diseases, such as cold, fever and stomach upset, has also arrived. Toddlers are most vulnerable to catch such common diseases as there immune system is not fully developed. Plus the air pollution only worsens the situation. Cold is the most common infection that a baby catches which tends to happen twice or thrice a year. Antibiotics are avoided in this age unless there is an emergency. So the question arises how to cure these diseases without the use of antibiotics? There are few home remedies that I have come to know which gave a lot of relief to my daughter. These home remedies are tried and tested, rarely have side-effects, cost is negligible and are mostly available in house. However, unlike antibiotics, such remedies may take a bit longer to cure the disease completely. Also, every child is different and what remedy suited my daughter does not mean it will work on other toddlers as well. So I would suggest if the situation does not improve within 2-3 days of using a remedy, consult your pediatrician at the earliest. Carrom Seeds (Ajwain) is a popular Indian spice that is available in almost every household. Boil some carrom seeds (Ajwain) in water and give it to your child once it is lukewarm. This helps in clearing blocked nose and also helps in dealing with respiratory ailments such as asthma and bronchitis. Add a pinch of Saffron (Kesar) to the boiled milk for kids aged one and above. You can also use pinch of Turmeric (Haldi) in the boiled milk. Turmeric has antiseptic properties that helps in dealing with viral infections. Try to give steam to the kid atleast twice a day. My daughter resisted taking steam directly, so I used electric steamer whenever she slept. You can also add Clove (Laung) to the water. Mix Mustard Oil with small strides of garlic and pinch of carrom seeds. Apply this mixture on the baby's chest, feet, back and neck on a daily basis. You can also store this oil for 4-5 days. Just heat the oil little before applying on the baby. If your child is one year or above, you can mix few drops of honey and ginger juice in lukewarm water and give it to your baby to tame cough. Make vegetable soup as it helps in dealing with sore throat and improves immunity. Use nasal suction pump to squeeze the mucus out of the child's nose. You can also put saline water (also known as salted water) to clear the nasal passage and make breathing easier. 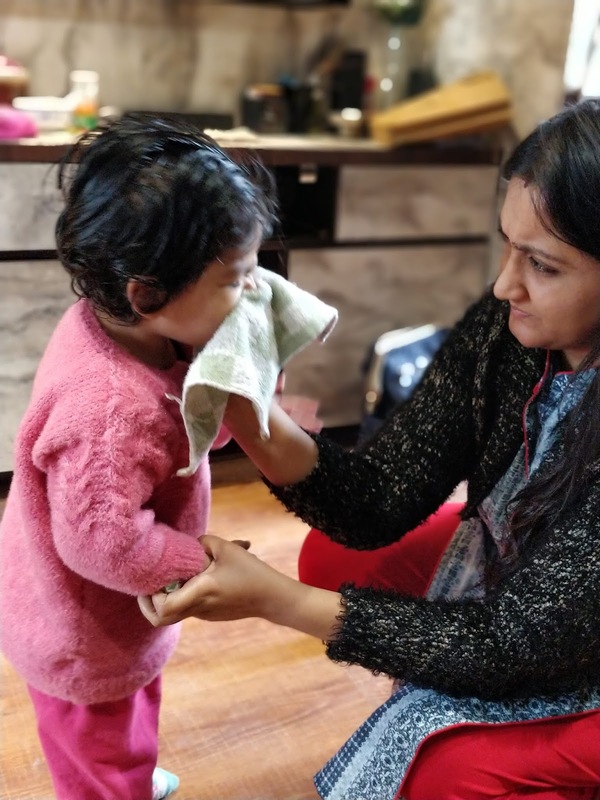 The most common home remedy which most of you must be knowing and have also seen in movies is to place a cool, damp cloth on your child's forehead for few minutes. Repeat this process atleast twice a day. You can also give your child lukewarm water bath. As the water evaporates from the skin, it will cool the body and bring the temperature down. Rubbing slices of an Onion on your child's feet is another common technique to reduce fever. Onion not only reduces the body's temperature but also relieves the body from pain. Mix 1 teaspoon of lemon juice with 1 teaspoon of honey and give it to your child (<1 year) to boost immunity. One of the oldest and most effective method is to make a paste of Asafoetida (Heeng) and carrom seeds with lukewarm water. Apply this paste on the baby' naval and nearby area. This helps in reducing stomach ache as it aids in releasing gas from the body. Add 1 teaspoon of Honey in a glass of lukewarm water if your kid is 1 year and above. You can add Curd to the child's diet to increase the intake of good bacteria. Papaya helps in dealing with constipation. You can also apply Castor Oil on baby's naval at night and repeat the process daily for 4-5 days. To conclude, I have used the above remedies on my daughter and so far they have worked in providing relief to her. There are other remedies available online but I have mentioned only the ones which I have tried. However, the most important thing is to take precautions in advance to minimize the occurrence of such diseases.